Infants born at very low birth weight are particularly vulnerable to cytomegalovirus infection. Premature infants, especially those born with very low-birth-weight (VLBW), are particularly vulnerable to cytomegalovirus (CMV) infection because of their immature immune systems. CMV infection can cause serious disease and, in severe cases, lead to death. Two important potential sources of CMV infection in premature infants are blood transfusions and breast milk. Neither source has previously been systematically examined in a large enough study, however, to quantify the specific risks of infection and identify risk factors to help guide prevention strategies. In a new study published in JAMA Pediatrics, researchers have confirmed that the common strategy of transfusing blood products to VLBW infants that are CMV-seronegative and leukoreduced (blood products with white blood cells removed) effectively prevents transmission of CMV from blood transfusion. Using this transfusion approach, maternal breast milk becomes the primary source of postnatal CMV infection among VLBW infants. 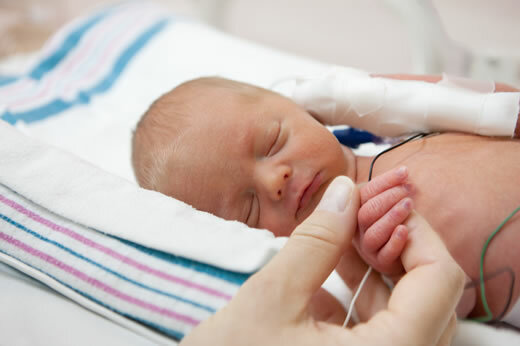 The prospective clinical study enrolled 462 mothers and 539 VLBW infants in three neonatal intensive care units between January 2010 and June 2013. A majority of mothers had a history of CMV infection prior to delivery (CMV sero-prevalence of 76.2 percent). The infants were enrolled within five days of birth, and at the time of enrollment they had not received a blood transfusion. The infants were tested at birth to evaluate for congenital infection, and again at five additional intervals between birth and 90 days, discharge, or death. A total of 29 out of the 539 enrolled infants were found to have CMV infection (cumulative incidence of 6.9 percent at 12 weeks). Five infants with CMV infection developed severe disease or died. Although 2,061 transfusions were administered to 310 of the infants (57.5 percent), the blood products were CMV-seronegative and leukoreduced, and none of the CMV infections was linked to transfusion. Twenty-seven of 28 infections acquired after birth occurred among infants fed CMV-positive breast milk. The authors estimate that between 1 in 5 and 1 in 10 VLBW infants who are fed CMV positive breast milk from mothers with a history of CMV infection will develop postnatal CMV infection. "We believe our study is the largest evaluation of both blood transfusion and breast-milk sources of postnatal CMV infection in VLBW infants," says first author Cassandra Josephson, MD, from the Center for Transfusion and Cellular Therapies, Department of Pathology and Laboratory Medicine, Emory University School of Medicine and Children’s Healthcare of Atlanta. "Previously, the risk of CMV infection from blood transfusion of seronegative or leukoreduced transfusions was estimated to be 1 to 3 percent. We showed that using blood components that are both CMV-seronegative and leukoreduced, we can effectively prevent the transfusion-transmission of CMV. Therefore, we believe that this is the safest approach to reduce the risk of CMV infection when giving transfusions to VLBW infants. The American Academy of Pediatrics currently states that the value of routinely feeding breast milk from CMV seropositive mothers to preterm infants outweighs the risks of clinical disease from CMV. Although breast milk is the best source of nutrition for preterm infants, the authors note that new strategies to prevent breast milk transmission of CMV are needed because freezing and thawing breast milk did not completely prevent transmission in the current study. Alternative approaches to prevent breast milk transmission of CMV, say the authors, could include routine CMV-serologic testing of pregnant mothers to enable counseling regarding the risk of infection; closer surveillance of infants with CMV-positive mothers; and pasteurization of breast milk until a corrected gestational age of 34 weeks (as recommended by the Austrian Society of Pediatrics). Although most infants who develop CMV infection are asymptomatic in the neonatal period, a minority progress to develop serious symptoms. Routine screening for postnatal CMV infection may be one potential strategy to help identify these infants before they go on to develop symptomatic disease. The authors note that although the effect of asymptomatic postnatal CMV infection on long-term neurodevelopmental outcomes is not clear, the frequency of CMV infection in this study raises significant concern about the potential consequences of CMV infection among VLBW infants and points to the need for large, long-term follow-up studies of neurological outcomes in infants with postnatal CMV infection. Other study authors included John Roback, MD, PhD, Angela Caliendo, MD, PhD, Kirk Easley, MapStat, Andrea Knezevic, MS, Neeta Shenvi, MS, and Ravi Patel, MD, MSc from Emory University; Christopher Hillyer, MD, from New York Blood Center; and Michael Hinkes, MD, from Northside Hospital, Atlanta.